Patent ductus arteriosus, or PDA, is a congenital heart defect common in premature babies in which the ductus arteriosus (a vessel connecting the pulmonary artery to the descending aorta) fails to close. When this happens, it allows some of the baby’s blood to bypass the lungs. If left untreated, PDA can lead to pulmonary hypertension, cardiac arrhythmia (irregular heartbeat), and congestive heart failure. PDA affects nearly half of all micro preemies (delivered before 26 weeks or weighing less than one pound) and 15 percent of preemies born at 30 weeks. 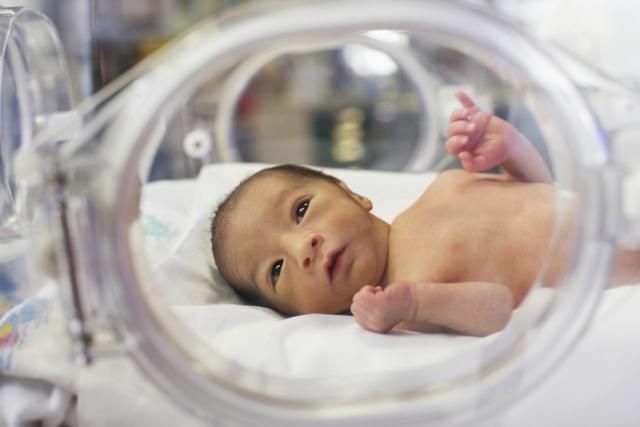 Few late-preterm babies have a PDA. Before birth, a baby’s blood is oxygenated by the placenta and not the lungs. Because of this, the respiratory system of the fetus is very different from that of a newborn. In fetuses, a small amount of blood goes directly into the fluid-filled lungs to nourish them. The rest is distributed to the body as blood is channeled through the ductus arteriosus, into the aorta, and out of the heart. Upon birth, the respiratory function changes: the baby begins to breathe air, and any blood transported to the lungs is oxygenated. At this stage, the ductus arteriosus is meant to close. When it doesn’t, some of the deoxygenated blood bypasses the lung and is re-routed to the aorta where it is pumped to the body in deoxygenated form. If a PDA is suspected, an echocardiogram of the heart will typically be performed. The technique, also known as a cardiac echo, uses sound waves to capture motion in the heart. A chest X-ray may also be ordered (as large PDAs can cause as enlargement of the heart). If diagnosed, most small PDAs will be left to close on their own. If the PDA causing symptoms, the doctor may opt to treat with IV medications such as NeoProfen (a special form of ibuprofen) or indomethacin. For those with experiencing pulmonary hypertension, a fluid restricted diet may be prescribed to prevent the excessive buildup of fluids which can place undue pressure on the heart. In some cases, surgery may be required. For babies in need of surgery, a relatively common procedure, called PDA ligation surgery, can be performed. Most do not require open heart surgery but instead use a catheter inserted into the femoral artery or vein to remotely close the opening. National Heart, Lung, and Blood Institute: National Institutes of Health. "Patent Ductus Arteriosus." Bethesda, Maryland; updated September 26, 2011.